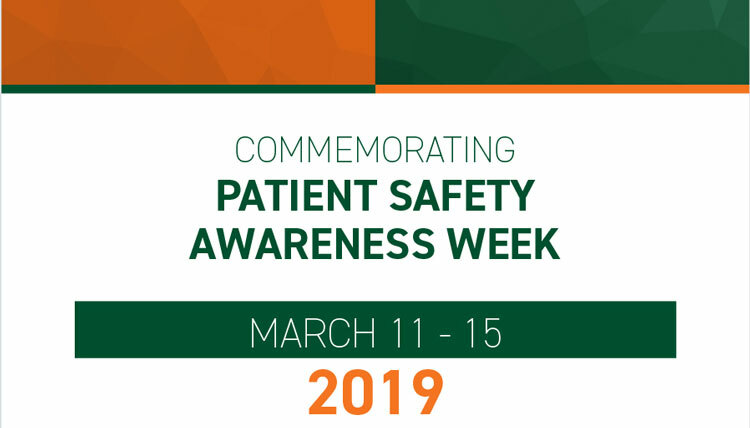 Monday, March 11, begins UHealth’s observance of 2019’s Patient Safety Awareness Week — an annual national campaign to increase awareness about patient safety among health care professionals and the public. This year’s theme is “Zero Harm” — an affirmation of our dedication to creating the safest possible environment for our patients and for each other. You’ll see that echoed in our signage, handouts and presentations in the following schedule of events. BPEI – Main Lobby – 8A.M.-10A.M. Naples – Main Lobby – 9A.M.-11A.M. Information Table at BPEI Lobby, 8A.M.-10A.M. Information Table at BPEI Palm Beach Gardens – 1st FL Breezeway, 9A.M.-5P.M. Information Table at Coral Springs, Coral Springs – Lobby, 9A.M.-5P.M. Information Table at Lennar, Lennar – Main Lobby, 10A.M.-12P.M. SCCC – PSAW Roving Cart, 7A.M.-8A.M. BPEI: Zero Harm IS Achievable Video/Discussion, Berrocal Auditorium, Viewing & Discussion at 1P.M. & 3P.M., Moderated by Dr. Eduardo Alfonso. To join the 1P.M. session, click here (PH: 571-392-7650 and PIN: 614 135 8110). To join the 3P.M. session, click here (PH: 571-392-7650 and PIN: 900 419 3428). SCCC: Zero Harm IS Achievable Video/Discussion, Room 1301, Viewing & Discussion at 9A.M., 12P.M., 4P.M. UHT: Zero Harm IS Achievable Video/Discussion, Surgical Conference Room, 2nd FL Viewing & Discussion at 1P.M. Naples – Main Lobby – 1P.M.-3P.M. Palm Beach – 1st FL Breezeway, 9A.M.-5P.M. BPEI – 2nd FL Breezeway, 10A.M.-5P.M. Hollywood – 1st & 4th FL, 8A.M.-10A.M. Information Table at BPEI, Lobby, 8A.M.-10A.M. Information Table at UHT, UTower – Lobby, 9A.M.-1P.M. Information Table at BPEI Palm Beach Gardens, Palm Beach Gardens – 1st FL Breezeway, 9A.M.-5P.M. Hand Hygiene Demo with Mascot, BPEI – 1st FL Lobby, Back Entrance, 8A.M.-10A.M. Hand Hygiene Demo with Mascot, Lennar – PACU 2nd FL & 4th FL CTU, 10A.M.-11A.M. UHT: Zero Harm IS Achievable Video/Discussion, Surgical Conference Room, 2nd FL Viewing & Discussion at 9A.M. Jeopardy, UHT – Surgical Conference Room, 2nd FL, 10A.M.-11:30A.M. Jeopardy, SCCC – Room 1301, 3P.M.-4P.M. Room of Errors, SCCC – Room TBD, 9:30A.M.-10:30A.M. Room of Errors, Palm Beach Gardens – Boardroom, 11A.M.-3P.M. BPEI – 2nd FL Breezeway – Judging 11A.M.-1P.M. & Winner Announcement after 3P.M. Lennar – 2nd FL Administration Hallway, 4P.M. SCCC – Room 1301, 10A.M. UHT – Surgical Conference Room – 1:30p.m. SCCC – PSAW Roving Cart, 7P.M.-8P.M. Information Table at Lennar, Main Lobby, 10A.M.-12P.M. Information Table at UHT, Main Lobby, 9A.M.-1P.M. Information Table at Kendall, Kendall – Lobby, 11A.M.-1P.M. Hand Hygiene Demo with Mascot, UHT MICU & SICU, 10A.M.-11A.M. Jeopardy, SCCC – 1301, 1P.M.-3P.M. Jeopardy, Coral Springs – Employee Break Room, 11A.M.-1P.M. Room of Errors – Presented by the Center for Patient Safety, Lennar – GYO Clinic Room, 3:30P.M.-4:30P.M. SCCC – PSAW Roving Cart, 1P.M.-3P.M. UHT – PSAW Roving Cart, 7P.M.-8P.M. POSTER BOARD SHOWCASE FROM 9A.M.-12P.M. *HEALTH SYSTEM POSTER BOARD WINNER ANNOUNCED AT 11:30A.M. Naples – Main Lobby, 10A.M.-12P.M. Room of Errors – Presented by the Center for Patient Safety, UHT – 1141, 9:30A.M.-10:30A.M. Jeopardy, Palm Beach Gardens – Boardroom, 11A.M.-3P.M. Jeopardy, BPEI – Berrocal Auditorium, 12P.M.-1P.M. Jeopardy, Hollywood – 1st FL, Suite 1B, 8:30A.M. BPEI – Main Lobby, 8A.M.-10A.M. Room of Errors – Presented by the Center for Patient Safety, BPEI – Retina Room 128, 2P.M.-3P.M.